Workbox: Constellation Asset Advisors, Inc. Launches New Website Built by Workbox, Inc.
LAS VEGAS, NV– Constellation Asset Advisors, Inc. (CAA) today announced that it has launched its new corporate site, www.ConstellationAA.com, developed by its web designer and partner, Workbox, Inc. of San Francisco, CA. The website provides a comprehensive overview of CAA including News, Services, Partners, and Testimonials. One of CAA’s core beliefs is that all publically traded companies should have a professionally-produced website that clearly and transparently communicates up-to-the-minute information such as press releases and company updates. Workbox websites enable a corporation to efficiently manage the enormous daily flow of investor and shareholder requests that a result from effective and consistent communication. Small companies should aspire to look their best and using Workbox as their web developers will help build recognition and respect on Wall Street and among existing and prospective investors. 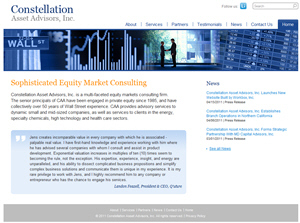 Constellation Asset Advisors, Inc. (“CAA”) is a multi-faceted equity markets consulting firm. The senior principals of CAA have been engaged in private equity since 1985, and have collectively over 50 years of Wall Street experience. CAA provides advisory services to dynamic small and mid-sized companies, as well as services to clients in the energy, specialty chemicals, high technology and health care sectors. CAA seeks to partner with publicly traded, fully reporting entities. It provides advisory services on acquisition and merger management, capital investment, turnarounds, and a myriad of other business transactions. CAA brings further value by using its multi-market experience and top-level strategic alliances to bring together unique, undervalued assets and the groups that can most efficiently capitalize on them. CAA maintains a strong emphasis on established, long term partnerships and business arrangements with the best companies and partners in their respective markets. This report includes forward-looking statements covered by the Private Securities Litigation Reform Act of 1995. Because such statements deal with future events, they are subject to various risks and uncertainties and actual results for fiscal year 2011 and beyond could differ materially from the Company’s current expectations. Forward-looking statements are identified by words such as “anticipates,” “projects,” “expects,” “plans,” “intends,” “believes,” “estimates,” “targets,” and other similar expressions that indicate trends and future events. Factors that could cause the Company’s results to differ materially from those expressed in forward-looking statements include, without limitation, variation in demand and acceptance of the Company’s products and services, the frequency, magnitude and timing of paper and other raw-material-price changes, general business and economic conditions beyond the Company’s control, timing of the completion and integration of acquisitions, the consequences of competitive factors in the marketplace including the ability to attract and retain customers, and the Company’s success in attracting and retaining key personnel. The Company undertakes no obligation to revise or update forward-looking statements as a result of new information since these statements may no longer be accurate or timely.